The fourth SAP Inside Track Copenhagen event (wow, time flies!) is coming up on Saturday, November 17th. As always, the agenda for the day will consist of talks given by community members like you and me, and you are hereby invited to submit your session proposal. We don’t have an overall topic or theme, so feel free to propose a talk on any subject that you care about it; be it technical, non-technical or anywhere in between. You can present slides, draw on a whiteboard, demo your new open-source tool, run a workshop, or do something else entirely. Also, don’t worry if you’re new to public speaking; we welcome everybody from the SAP Inside Track newbie to the seasoned conference speaker. 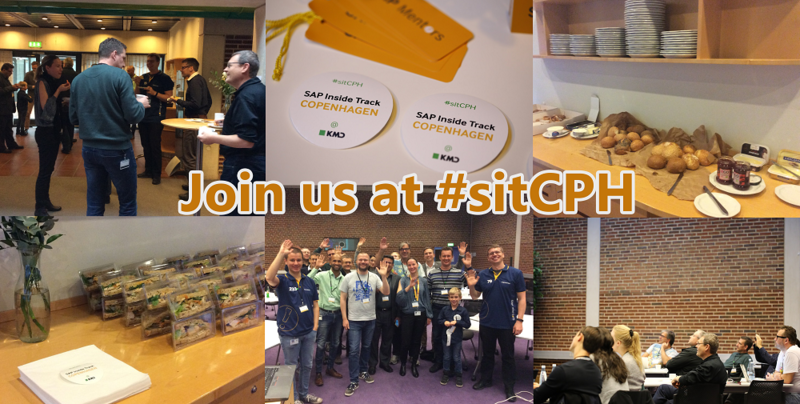 We’re a friendly bunch, and SAP Inside Track Copenhagen is run in the spirit of Danish “hygge”, which roughly translates to a group of people having a nice time together in a chill, laid-back atmosphere. The talks are usually round about 30 minutes, on-site and in English. To submit your proposal, please fill out this form. The submission form stays open for one month. Registration for the event will open around mid-October. If you have any questions whatsoever, please comment below or contact us on Twitter using the hashtag #sitCPH. P.S. The fine print: SAP Inside Track Copenhagen is a not-for-profit community event, and attending is free. Sadly, we cannot offer to cover speakers’ travel expenses, nor is there a fee for speaking at the event.